1. 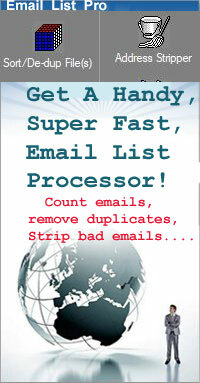 Your email marketing campaign will be started only 2 ot 3 days after you order if your order is up to $50. 2. You will be getting a high delivery rate into the inbox of recipients and therefor a high open rate. Targeted Email Blasts or targeted email marketing refers to an email marketing that allows you to reach a very specific type or group of people instead of just emailing to the general public. You can really make a lot of money or get a lot of valuable exposure from targeted email marketing because you can pay some reasonable amount of money and have your advertisement sent to exactly the kind of people that you want to reach. And because your targeted email blast is being sent out to your most likely future customers your rate of response can be very high. After you select your target below you can do a quick search to see pricing. Our pricing structure is by levels of targeting as explained below. 4. Level 4 will be adding one or more of these: income level, revenue of a company, age of an individual, or company size to what you have for level 3 and the targetiing adds a few more dollars.